Seeing Godspeed You! 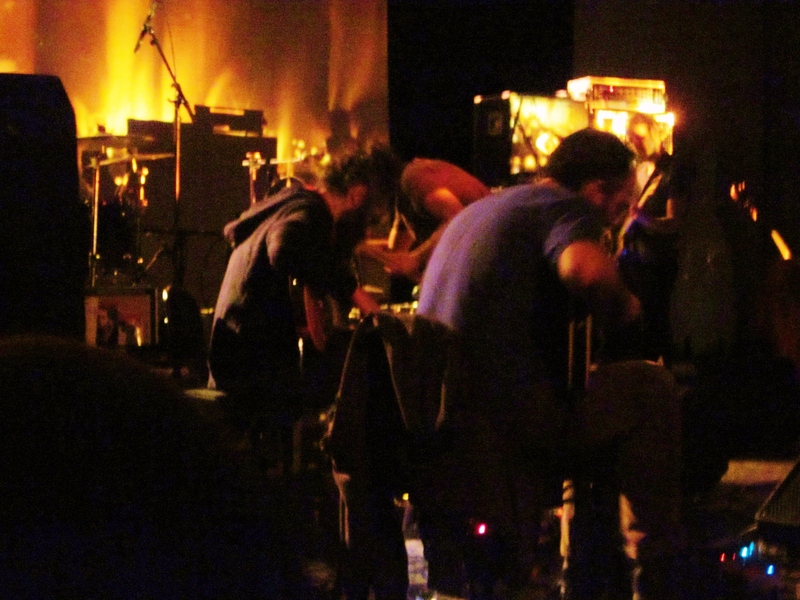 Black Emperor live is something that never existed in my realm of thought. They existed only as a myth to me, like some Canadian apocalypse predicting cult. Then all of a sudden a comeback is announced, tour dates are being set, Finland is on the list and I died and went to heaven. The live experience was a lot to take in, having built up expectations like skyscrapers. And no, they’re not “just a band“. One girl had to be carried away by her boyfriend only a few minutes into the first song.Throughout the concert they remained silent, living up to their enigmatic image. I had been hoping for some sort of end of the world-speech, but I wasn’t too disappointed. It was really impossible for them to disappoint me. If you went there hoping for interaction, a neon light show or band members jumping around on stage, then you were in for a let down. I guess many were bound to leave this concert feeling ambiguous considering that expectations on these kinds of larger than-life bands usually get blown to extreme proportions. GY!BE’s music is the kind that can leave you emotionally drained, which is exactly how I felt after the show. My entire body was hurting after being taken for an exhausting emotional death ride for two and a half hours. The highlight of the evening for me was the majestic “Albanian”, an almost 17 minute long ear drum attack. Time disappeared when they played, I started to notice that this was a long concert when the seemingly bored guy in front of me kept checking his watch. Everyone (except that guy) seemed to be somewhat hypnotized. The level of concentration among the audience was quite remarkable. There was almost complete silence between songs and it didn’t even feel right to applaud. GY!BE have established themselves as the most renowned band in the post-rock genre and their status has yet to be threatened. They take their music a step further than many of their disciples, who build their songs in quicksand. I feel that many post-rock bands fail to really speak through their music, something that GY!BE does organically.For a band that makes songs sans lyrics they’ve always been very vocal. They have always been consistent in everything from their music to their art and politics. At the concert their politics were everywhere, from the imagery and videos on the backdrop to the environmentally friendly t-shirts the were selling. In that sense I’d say that Godspeed You! Black Emperor is not only the best post-rock band out there, they’re one of our most important punk bands. Overall the visual aspect of the concert seemed intentionally downplayed. I would assume that GY!BE are well aware of their cult status and did their best to let the music speak for itself. The band was mostly only sparsely lit up by the video projections for most of the show. But as with their songs it’s up to you to hear what GY!BE doesn’t say out loud and see what ever their music makes you feel.